Summer is salad season and nothing beats a freshly picked home-grown lettuce for flavour and freshness. Lettuces are easy to grow and because they are shallow rooted they are easy to grow in pots and window boxes so everyone can enjoy freshly picked lettuce regardless of your garden size. Because lettuce seeds are very fine be sure to sow them into a tray of seed-raising mix or directly into finely tilled soil and lightly cover them with less than 0.5cm soil, then water them well. You may like to give your plants a boost halfway through the sowing season with some organic liquid fertiliser such as diluted worm tea. Most salad greens don’t do well in the heat so they will appreciate a shady spot and regular water to stop them bolting or being toughand dry. Once the plants are established you can mulch around them to help retain soil moisture. If planting in pots, start them in a sunny spot in spring and move them to the shade during the hotter months. If you have problems with birds or other animals eating the young leaves cover with netting and they are a favourite of slugs and snails so don’t forget to sprinkle with snail bait. Pick lettuces young and tender and if you can pick in the morning before any summer heat dries them out their leaves will have more moisture. By planting small amounts regularly and a mixture of varieties you will ensure a steady supply of both hearting and leaf varieties, different flavours and colours. For leafy green leaves to make the base of a salad try ‘Great Lakes’, ‘Summer Queen’, ‘Buttercrunch’ or ‘Tom Thumb’. I have had success with all of these lettuces and if watered well they don’t go bitter and are bolt resistant. For Caesar salad I now plant ‘Little Gem’. Half ‘Cos’ and half ‘Butterhead’ without the dry texture sometimes found with true ‘Cos’. The leaves are smaller and can be served whole, looking stunning in big leafy salads. Red lettuces are a ‘must have’ to add a splash of colour. Most red lettuces are leaf varieties, meaning you just pick the leaves as required and leave the plant to continue growing. If you have grown a plain green leaf lettuce why not try a red radicchio – a spicy Italian lettuce also referred to as chicory. Radicchio doesn’t like it too hot and dry so make a cover with shade cloth during hot weather. Light feathery lettuce leaves can turn a plain salad into a gourmet salad many of these have a peppery flavour adding zing to your meal. 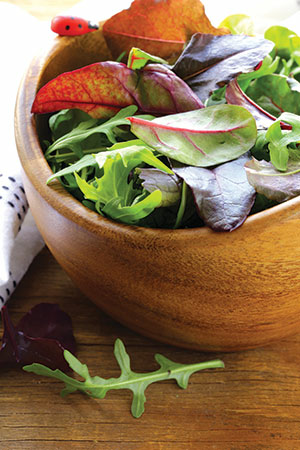 Include a mesclun mix which usually includes endives, rocket and mizuna. Edible flowers are a lovely finishing touch and great for salads. Favourites of mine are nasturtium, calendula, borage and Viola ‘Heartsease’. Over time you may develop some favourites, and then you can make your own salad mix by combining packets of your favourite seeds. At the end of summer be sure to let one of each of your favourite lettuce plants go to seed and save the seeds for next season. A variety of lettuces makes for interesting salads.